ALMON, WILLIAM JOHNSTON, physician and politician; b. 27 Jan. 1816 in Halifax, eldest son of William Bruce Almon* and Laleah Peyton Johnston; grandson of William James Almon*; m. 19 Nov. 1840 Elizabeth Lichtenstein Ritchie, daughter of Thomas Ritchie*, in Annapolis Royal, N.S., and they had 13 children; d. 19 Feb. 1901 in Halifax. 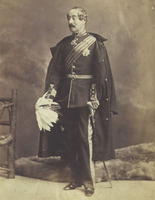 William Johnston Almon was educated at King’s College in Windsor, N.S., and in 1834 was awarded a ba. He registered in the faculty of medicine at the University of Edinburgh for the 1834–35 term and continued there for two additional terms. Completing his medical studies at the University of Glasgow, he was awarded an md by that institution in 1838. By April 1839 Almon was back in Halifax, and that month he was appointed an assistant surgeon in the 5th Regiment of Halifax militia. After his father died in 1840, Almon took over his drug and medicine store and succeeded him as physician to the Poor’s Asylum. In the latter capacity he attended the sick immigrants at Waterloo Hospital during the 1840s [see Matthias Francis Hoffmann*]. On 5 Feb. 1848, before amputating the thumb of a woman in the Poor’s Asylum, Almon arranged that she be anaesthetized by having her inhale chloroform from a rag applied to her nose and mouth. Only three months previously chloroform had been first administered by James Young Simpson in Edinburgh, and Almon had probably read Simpson’s account of the procedure. On 11 March, Almon used chloroform again, during an operation to amputate a leg. The chloroform employed on this occasion was manufactured by James Daniel Bain Fraser*, a chemist at Pictou. Almon was among the first doctors in North America to use the anaesthetic. In 1840 Almon had been one of many Halifax physicians who petitioned the legislature to have a hospital built in the town. The appeal was unsuccessful, and it was not until 1855 that Almon, Daniel McNeill Parker, and two other physicians began a private hospital, the Halifax Visiting Dispensary [see Frederick William Morris*]. 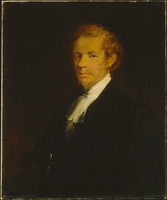 On 15 March 1854 Almon had attended the founding meeting of the Medical Society of Nova Scotia, and he served as its president for three terms. After the Medical Act of 1856 made licensing of doctors compulsory, Almon was appointed an examiner of candidates. 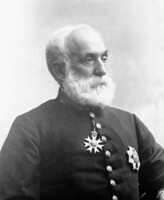 In 1867 he became a consultant and chairman of the medical board at the new Provincial and City Hospital, and the following year a founder and president of the faculty of medicine at Dalhousie College and professor of obstetrics. Almon remained president until the faculty ceased to exist after the Halifax Medical College was established in 1875 [see Edward Farrell]. He does not appear to have been active in setting up the HMC, but neither is there any indication that he opposed its organization. During the American Civil War, Almon strongly sympathized with the Confederacy, and he expended large sums of money on its behalf. He is said to have been personally thanked by the Confederate president, Jefferson Davis, “for his efficient and disinterested support of the cause.” Almon was the central figure in an affair in December 1863 involving the vessel Chesapeake at Halifax [see Sir Charles Hastings Doyle*]. Arrested for “interfering with the police in the discharge of their duty,” he was acquitted in the Supreme Court in 1864. William Johnston Almon was undoubtedly one of the most respected and active physicians and surgeons in Nova Scotia during the last half of the 19th century, and he probably trained more doctors than anyone else in the province. In addition to his medical and political activities, he was one of the founders of the Nova Scotia Historical Society in 1876, and he owned a remarkable library of literary and historical works. On more than one occasion he petitioned the federal government to restore the historic forts of Canada and to establish a national archives. Halifax County Court of Probate (Halifax), Wills, 12: 36 (mfm. at PANS). PANS, MG 1, 14: 71; MG 20, 670, no.4; RG 22, 26: 25; RG 25, C, 5, book 2: 17–18; RG 34–312, P, 21, 16 May 1864; RG 83, 1, no.1: 43 (transcription of Almon’s medical diploma from Univ. of Glasgow, 1838). Univ. of Edinburgh Library, Special Coll. Dept., Medical matriculation index, 1834–37. Christian Messenger, 4 Dec. 1840. Evening Mail (Halifax), 22 Dec. 1896. [This lengthy newspaper article describes the incident involving Almon and the Southerners. a.e.m.] Halifax Herald, 19 Feb. 1901. Morning Chronicle (Halifax), 28 April 1855. Novascotian, 15 Oct. 1840. Acadiensis. (Saint John, N.B. ), 2 (1902): 39. Canadian biog. dict. Canadian men and women of the time (Morgan; 1898). A cyclopedia of American medical biography, comprising the lives of eminent deceased physicians and surgeons from 1610 to 1910, ed. H. A. Kelly (2v., Philadelphia and London, 1912). A. C. Dunlop, “Pharmacist and entrepreneur: Pictou’s J. D. B. Fraser,” N.S. Hist. Quarterly, 4 (1974): 12–13. K. A. MacKenzie, “The Almons,” Nova Scotia Medical Bull. (Halifax), 30 (1951): 31–36. A. E. Marble, Nova Scotians at home and abroad, including brief biographical sketches of over six hundred native born Nova Scotians (Windsor, N.S., 1977). Maritime Medical News (Halifax), 13 (1901): 105–9. Allan E. Marble, “ALMON, WILLIAM JOHNSTON,” in Dictionary of Canadian Biography, vol. 13, University of Toronto/Université Laval, 2003–, accessed April 22, 2019, http://www.biographi.ca/en/bio/almon_william_johnston_13E.html.